Vivian Maier was an enigmatic nanny and an extremely prolific street photographer who passed away in 2009. She’s the subject of the film Finding Vivian Maier. Lynn, Mary and I saw it when it played recently in Orlando. I enjoyed the movie and recommend it to anyone, especially if you’re interested in photography. If you haven’t followed her story, you can easily catch up by googling her name or clicking on her website (first link above). It’s worth your time. What I find fascinating is that while she made over 100,000 photographs, she was completely unknown before they were discovered in an abandoned storage locker in 2007. And her photos are very good. She captured street scenes in Chicago and other places that show us what life was like. She was obviously passionate about photography. But – she apparently had no interest in sharing her work. There were even 2000 rolls of film that she never developed. Brooks Jenson (publisher of Lenswork Magazine) has a podcast that I listen to. His latest one is a little over 7 minutes long, and in it he talks about why we photographers are so passionate about what we do. For him, photography is a way to explore life. I like that idea. It seems Vivian Maier was exploring life around her with her photography too. He goes on to say that there are two sides to photography: The observation / capture side, and the publication / sharing side. Brooks says you can’t have one without the other. I think that’s right for most people. They want to share something they’ve seen with others. Something that they see differently or that others may pass by. Street photography isn’t my forte, but I suppose we need at least one photo for this post. Vivian Maier would sometimes include herself in her photos. So here’s my attempt. Waiting at the corner of Venice and Nokomis – I was playing with my camera while the ladies shopped. Vivian Meir’s version of this would be in Black and White, and probably use a vertical 4×5 format. It also might include a reflection of her, not me. I find Vivian Maier’s story compelling. She did the observation / capture side of photography without the publication / sharing side. Until recently her photography was incomplete since no one had seen it. After she’s gone, her work is finally being shared and we’re seeing some of what she observed. Thanks for stopping by and reading my blog. Now, go make some photos – and share them! I’ve written about Casey Key before. Lynn and I have been visiting this little island on the Gulf coast of Florida for many years. If you’d like to read other articles about it, click on the “Casey Key” link under the “Places / Categories” menu over on the right. When we got home this week and I reviewed the photos I made there on this trip, I was struck by how much the clouds enhance the images. This strong storm moved through one afternoon and dropped considerable hail and rain on the area. But we also got to see the awesome cloud front pass over the beach. This next photo includes some lovely clouds too. And finally, here’s one last photo combining the sky and wispy sunset clouds with a sun or beach totem – not something I see everyday. I have more photos from Casey Key as well as larger versions of the ones above in this set on Flickr. Clear skies are often boring. Clouds and storms add interest and drama, and enhance almost any photo. Add some clouds to your compositions. Thanks for stopping by and reading my blog. Now, go find some clouds – and make some photos! We’re busy this weekend with computer and roof problems, so not much time for photography. Here’s a few more photos from our beach trip last week. The mermaid in the garden by the sea – From the patio behind the hotel. 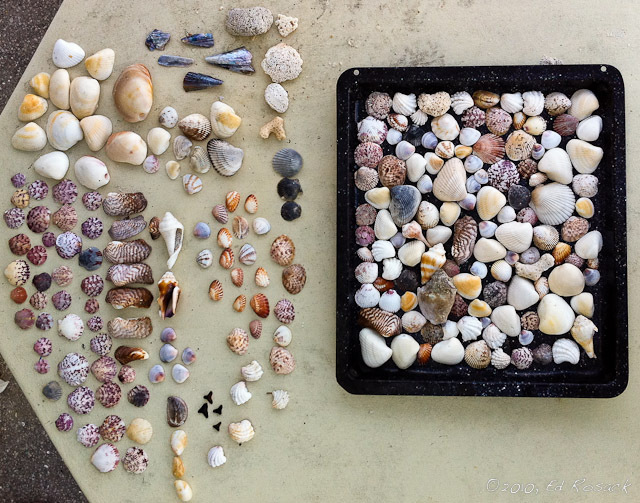 Morning shell-scape – Casey Key is a prime spot for shell and shark’s teeth collectors. Hurricane Issac passed off shore and stirred things up, resulting in lots of shells on the beach. Florida and Florida beaches are a great photo-op, especially at sunrise or sunset – and Casey Key on the Gulf Coast seems to have a unique color pallet. It doesn’t hurt to have some stormy weather around to add drama to the sky and clouds. I saw the beach chairs sitting empty and pointing toward the setting sun and felt compelled to make a photo. At the end of the day 2 – On Memorial Day Weekend 2012: The empty chairs in this scene made me think about past and present members of the military that can’t be with family to celebrate the holiday. To all those that serve or have served, thank you for your service.